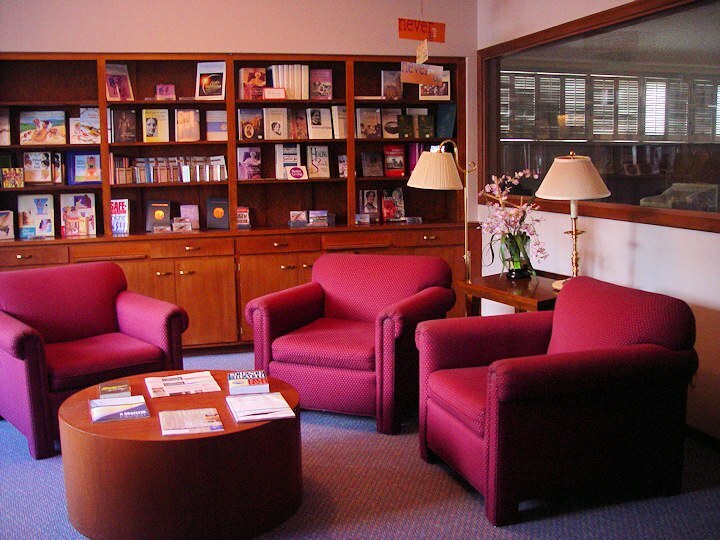 The Reading Room is an outlet for publications of The Christian Science Publishing Society. Besides the sales room, it houses a reference library and a study room where the public is welcome to read, browse, study, or pray. It is open Tuesday, Thursday, and Friday from 10 a.m. to 2 p.m., except for public holidays. It also opens on request after any Sunday service or Wednesday evening meeting. We have wireless internet and a computer for accessing the various web sites related to Christian Science. (See the Links page for some of these.) This includes the ability to listen to the previous Sunday's service from The Mother Church. The Bible Lesson Discussion Group meets on the second Saturday of each month at 11 a.m. in our reading room. (Occasionally the date changes. Click on the link in the blue box above to check on the next date.) Anyone interested is welcome. Come along and hear what others have discovered in studying the current lesson. All are welcome to join our Bible Study Group, which meets each month. We are working our way through the Bible, covering one Bible book every month. We meet in our Reading Room at 610 Foothill Blvd., La Cañada Flintridge, usually at 11 a.m. on the 4th Saturday of the month. (Occasionally the date varies. Click on the link in the colored box immediately above to confirm the latest date, or see our calendar.) You are welcome to come even if just to listen. And you can participate via telephone or Skype. The Christian Science Journal, Sentinel, and Herald Online: The Christian Science religious magazines have never been more accessible to subscribers. Now you can read them from your computer, table, smartphone, or any device with an internet connection. Visit JSH-Online.com. Books available to purchase or study in the Reading Room: These include Bibles, concordances to the Bible, Science and Health with Key to the Scriptures by Mary Baker Eddy, the discoverer and founder of Christian Science, and other writings by Mrs. Eddy. There are also other books related to Christian Science and the church. There are CDs and cassette tapes of books by Mrs. Eddy, inspirational articles from the Christian Science magazines, hymns and praise music, and testimonies from people healed through Christian Science. And there are special items for children. The study room contains many reference works, such as Bibles and Bible dictionaries, and resources for studying Christian Science and its history. Of particular interest is a full set of all issues of The Christian Science Journal and the Christian Science Sentinel dating from their very first editions in the late nineteenth century.